Morphe can just have my wallet. They are KILLING it with the hot new items they’ve been dropping! Next, Morphe is releasing a NEW collection for the holiday called Dare To Create on Tuesday, 11.07! The collection includes the Dare To Create eyeshadow palette ($32), the 15D & 15N Eyeshadow Palettes (each $15), the Bling It On Brush Collection ($79) & Paint The Town & Daring Metallic Liquid Lipstick Sets ($12). This is ALOT to take in so let’s break it down, shall we? Have you seen a more FALL collection of lip shades in one photo?! I think not. These are gorgeous! The Paint the Town Red set includes, obv, redish hues! One is a true, bright red. One is a burnt, orange red and the other is a deeper, red-toned berry shade that we personally are eyeing up right now. We aren’t so crazy about super lumi shades but the Daring Metallic set includes a bright bold copper tone and a lovely deep, burgundy plum tone. All of these are going to find their way to your purse this fall & winter because they are just the shades of season, you know?! They’re necessary. While Morphe brushes are renowned for being incredible in quality, versatility, assortment and longevity! We can’t get enough. But these don’t totally blow our skirt up – I mean, they look like they are going to be SO SOFT and we can see like, a million uses for them but why are the handles so dang bulky?? I am veryyyyyy into the color (what even is that? It’s kind of silver but kind of rose gold but kind of redish burgundy? It’s totally lovely and very holiday but not super practical, ya know? You know we saved the palettes for last because that is what really gets our heart rate up. 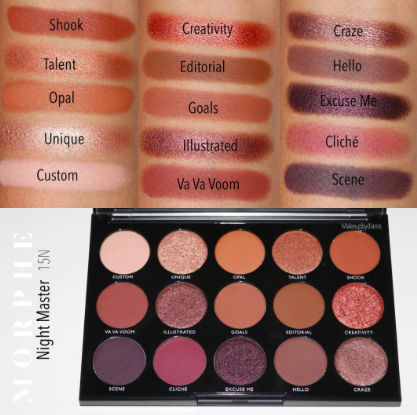 The 15N (Night Master Palette) is going there for us. 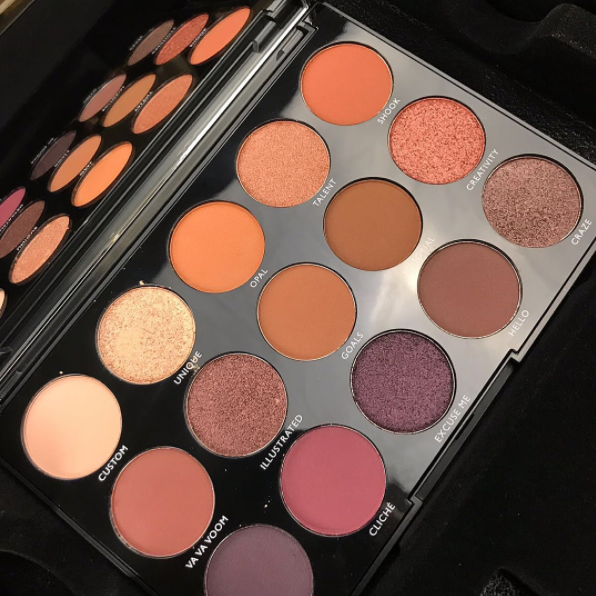 We are suckers for a palette that features warm tones and a variety of purples all in one palette! Do you see those swatches?! SO STUNNING! And only $15?! Are you serious?? Like I said, just take my wallet because yes, I will need this. The best part?! Besides everything… IT HAS A MIRROR. Morphe palettes NEVER have mirrors. This is a big deal. It really completes this palette and solidifies it as one that can truly be used for every purpose – from everyday to travel and everything in between! The other palettes in this new collection didn’t really catch our eye but they are also quite pretty and might totally be up your alley! Which items from the collection do you have your eye on? !